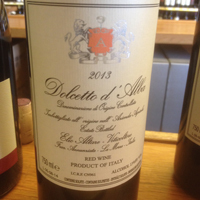 2013 Elio Altare, Dolcetto d’ Alba DOC, Piedmonte, Italy. The Altare 2013 Dolcetto is a marvelous success in what is easily the toughest vintage since 2002 in Piedmonte, and it shows all the right stuff to be an excellent and friendly food wine and no pretense quaffer. This La Morra Dolcetto, grown in Barolo vineyards starts with dark berry, minty herbs, dark flowers and earthy spices lifting from the glass in this deep colored wine, on the palate it feels a touch light and brittle, but picks itself up with air and there is plenty of joy in the mouth with good fruit intensity. While just about medium weight, admirable clarity of fruit comes through with blackberry, tangy cherry, plum and blueberry fruits showing nicely along with red peach, orange rind, licorice, mineral and rustic earth/loamy notes. There is a crisp nature in this Dolcetto d’ Alba and while impressive and enjoyable, it is a pure reflection of year and place, not altogether hiding the difficult growing conditions, it is certainly not perfect or a great wine, but it does deserve merit and praise for as good as it is, and I would love to have a case to pop open with dinner over the course of the next year or so. This is a fun, well made and true to it’s terroir wine, it might be the best Dolcetto, or Barbera I’ve tried from the 2013 vintage so far, and I kinda like it, it will be great with Pizza, Pasta and or picnics, drink from 2015 to 2017. Altare is a super star producer and all his wines are worthy, but there is no question his Barolo is the main attention and they are some of Italy’s finest examples, especially his 2010’s which are hitting the shelves now, but for now and for any Tuesday night, the Dolcetto will do just fine by me. 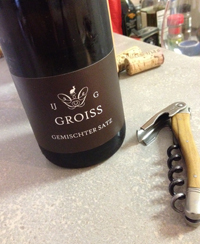 2013 Weingut Ingrid Groiss, Gemischter Satz, White Blend, Breitenwaida-Weinviertel, Austria. This wild natural field blend, the Gemischter Satz Trocken 13% alcohol from 50 year old vines, has 17 different varietals interplanted including Chardonnay, Muller Thurgau, Welschriesling, Gruner Veltliner, Riesling, Grauburgunder, Pinot Blanc, Malvasier as well as rare and ancient varieties such as Neuburger, Zierfandler, Rotgipfler, Samling, Roter Veltliner, Grauer Voslauer, Hietl Rote, Weisse Voslauer and Silberweisse. Wines like this are going to make the young and charismatic Ingrid Groiss a superstar, this gorgeous white possesses a wonderful cascade of flavors, mineral tones and striking acidity, this is a dynamic and totally unique wine that has great fruit intensity and dry extract, that is both hedonistically pleasing and vibrantly vivid, this is seriously electric stuff. The nose is bright and mineral driven with apple, quince and citrus along with hints of clove spice, briny sea notes and white flowers leading to a flowing palate of yellow peach, ripe pear, lemon/lime, green and golden apple and kumquat plus wild herbs, sea salt, chalky wet stone, a hint of loam and lingering apricot and tropical fruits. There is plenty of style and substance to admire here, this is well made and balanced wine, I highly recommend searching out this wine and Ingrid’s stunning Gruner Veltliner as well, Grioss is a great new talent and her wines are riveting and offer a thrill ride on the palate, probably the best new winery from Austria I’ve tasted in the last 5 years and her 2013’s are a fantastic set of offerings, drink over the next 3 to 5 years. 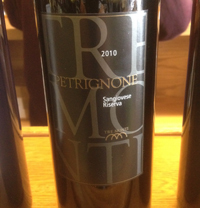 2010 Tre Monti “Petrignone” Sangiovese Riserva, Sangiovese di Romagna D.O.C. Superiore Riserva, italy. True Monti’s beautiful and rich Petrignone is pre and dark Sangiovese from Italy’s Romagna region, grown on sandy clay and gravelly soils, similar to the Medoc, and it gives the wines depth, full maturity and old world charm. This wine a Sangiovese Riserva has won many awards in Europe and has gained a following here as well along with good critical reviews, I have tasted a few vintage’s now and can highly recommend these Tre Monti offerings, especially to customers looking for well made wines at great prices, and also to wine bars and bistros that are looking for superb wines for cuisine and or interesting and pleasing wines for by the glass. The Petrignone is a serious effort with deep garnet and ruby color, a nose that shows black fruits, spice and wood notes leading to a lush and full bodied palate of plum, black cherry, raspberry and currant fruits with cedar, sweet tobacco, licorice, mixed herbs, mineral and vanilla. This wine, while clearly Sangiovese and terroir driven, reminds me of a fine Rioja, it has that mouth feel, class and style, this is impressive and wonderfully textured wine, the finish is lingering with a mix of dark fruits, earthy notes and strawberry tart. The acidity and smooth/creamy tannins give vigor and structure, but never intrude on the pleasurable experience, the 6 months in used Bordeaux like Allier barrels really add polish and grace to this enjoyable Sangiovese di Romagna, drink from 2015 to 2021. 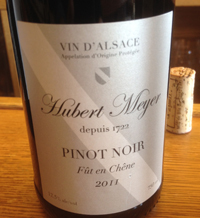 2011 Hubert Meyer, Pinot Noir, Fut en Chene, Vin d’Alsace, France. This is beautiful and character filled wine, a detailed and complex Pinot Noir with full flavors and only at 12.5% alcohol. One of the best values in top quality Alsatian Pinot Noir, this Hebert Meyer is a real steal and a great new discovery, along with their fine sparkling wines and superb Riesling and Gewürztraminer. The 2011 Fut en Chene, aged in oak, has nice ripe fruit, earth and spice with a flowing silky texture and a good lingering finish along with refined acidity keeping everything in control, this is a very stylish example of terroir and varietal, this little gem puts some Burgundy, California and Oregon wines to shame in this price point. Hubert Meyer’s lovely Pinot Noir starts with dusty cherry, rose petals, hints of mineral, game and light pepper notes before folding into a medium weight palate of plum, raspberry, truffle, chalky stones and flinty spices with a hint of creaminess, think round and soft, but with nice vigor and vibrancy to the flavors, this is very pleasing stuff, I highly recommend keeping your eyes out for this well crafted Pinot, imported by H. Mercer, drink from 2015 to 2018. 2013 Weingut Selbach-Oster, Riesling, Anrecht, Zeltinger Himmelreich, Mosel Germany. 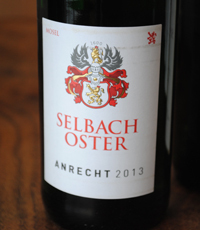 This is a fabulous white wine, I rank it up there with the great wines of the world, and it sells at a ridiculously undervalued price for the sublime experience on offer, the 2013 Anrecht by Selbach-Oster is a masterpiece. Johannes Selbach crafts a few single block Rieslings each vintage, they belong to no classification system, they are single block wines that come of unique and old vines above the Mosel, these wines stand out with density, depth and striking mineral intensity. I put them up there with Chave or Chapoutier Hermitage, or the Grand Crus of Laflaive, but still with pure Riesling character and expression, these are big and powerful examples, coming in at Auslese must weights, and while not dry, they deliver an amazing balanced feel, especially the Anrecht, which feels lush and hedonistic on the palate without cloying sugar. Once you free your mind of perceptions, you’ll discover a whole new world of pleasure, the layers of detail found in the Selbach-Oster Anrecht are mind-blowing, this certainly is a white wine for red wine lovers, I must thank Johannes Selbach for making such a glorious outside the box wine and Terry Theise for the inspiration and passion for Riesling, they both introduced me to the joyous world of German wines and Riesling in particular. The 2013 Anrecht starts with white roses, salty stones, light honey notes and tropical essences, leading to a full-bodied palate of liquid mineral, yellow peach, green apple, apricot, lime and mango along with savory, cured meat/bacon, asian tea, smoky flinty spice and brine. The texture is creamy, lavish and flowing, but there is ever present acidity and lift, a deep focus that leaves a tangerine and honey play for control, the sugar takes away any shrill or bitterness, while the mineral tones and vibrancy keep everything tight and precise. This wine has blossomed and is a stunning Riesling, for now or for cellaring up to 15 years or more, absolutely gorgeous, drink from 2015 to 2028. 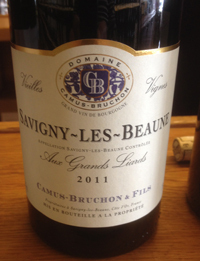 2011 Domaine Camus-Bruchon & Fils, Savigny-Les-Beaune, Aux Grands Liards, Vieilles Vignes, Red Burgundy, France. This wonderful Cote de Beaune Pinot Noir comes from the 90 plus year old Grand Liards vines in Savigny-Les-Beaune and is made by Lucien Camus, latest in a long line of generations to make wine in Burgundy, he is really coming into his own at the helm of Domaine Camus-Bruchon, and this wine reflects his growing talent and reputation. Lucien is a vineyard winegrower, he loves his vines and spends most of his time with them, he is a traditionalist in the cellar, he only uses about 15% new oak and employs long maceration and fermentations, he wants the grapes to give everything they have to offer, with no filtering or fining used to delivery purity and balance of fruit and tannin. The Camus-Bruchon have been superb in the last few vintages and remain savvy wines for the Burgundy enthusiast, they offer great terroir driven flavor and character at a great value, the 2008, 2009 and 2010’s were lovely, but this 2011 is showing great and is a steal, this is a buyers year for Burgundy if you know where to look, and this 2011 Camus-Bruchon Aux Grands Liards Savigny is a fantastic bottle of wine, it shows depth, palate density and a glorious layered mouth feel with plum, black cherry and raspberry fruits, tea spice, hints of wild game, anise, bitter herb and cedar along with mineral and chalky stones. Beautiful floral tone lead in the glass with violets, rose petal, a touch of pepper and lavender waft from the glass in this vigorous Pinot that shows refined tannin, lifting acidity and a silky rich texture in a medium weight frame. This is really worth looking for, imported by Beaune Imports, and it has a good drinking window, and is damn good now, this old vine Burgundy should be best from 2015 to 2022, this is lovely, impressive and expressive stuff made by a domaine on the rise. 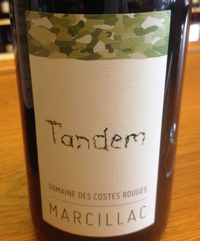 2013 Domaine des Costes Rouges, Marcillac Rouge “Tandem” Mansois, South West, France. A tiny country estate in the wilds of southwest France, the Domaine des Costes Rouge is a wife and husband property run by Claudine and Eric Vinas, they do everything themselves and grow their Mansois vines organically. Eric is a former restauranter, but still offers farm made fare/cuisine who happen to search out their beautiful hillside winery. The wines are all estate and organic grown 100% Mansois, these are natural, rustic and charming wines with terroir and real unique personality, the latest set are especially appealing and engaging. The Domaine des Cotes Rouges Tandem 2013 is bright, lightly fruity with medium weight and shows tangy red fruits, earth, spice and soulful character, it was fermented in cement vats in their underground/cellar keeping the process naturally cool then the wine is raised in cement tanks until the following spring, then the wine is bottled and rested until fall. The 2013 Tandem starts with plum and cherry fruit with hints of raspberry, cranberry and blueberry along with a Loire Cabernet Franc like bell pepper note, game, wet/loamy earth, truffle, wild herbs, a touch of red and black pepper, fig and stone/mineral. There is a bit of zesty acidity, mild tannin rawness and vigor. but still pleasing and easy on the palate, and it’s hard not to enjoy the pure honesty of this wine, it’s sense of place and the true nature, with low alcohol, about 12%, this is a fun and expressive wine. Enjoy this Marcillac, imported by Charles Neal, over the coming year or so, drink from 2015 to 2018. 2010 Uccelliera, Brunello di Montalcino DOCG, Tuscany, Italy. There is a lot of intense hype about the 2010 vintage Brunello wines, the expectations are sky high and many critics are jumping all over themselves to declare it the greatest year for Brunello in our lifetime! Will all this swirling around it is hard to see the forest for the trees, but yes it will be a classic vintage for this Tuscan region and it will be good to get some of these mythical wines for the cellar, but these wines are going to take some time to develop, fill out and right now on release are not showing their potential, much the same way Burgundy tends to be. If you were as excited as I was to taste these wines, you’ll need to take a deep breath and relax, they have plenty on offer, it just will need a few years in bottle, the best show reduction and are tight as a banker’s wallet. The new 2010 Uccelliera, from a long cool year in the hilltop town, will be majestic, it has everything in raw form to become a 95-98 point wine, but there will be a waiting period of 5 to 10 years to get the full picture here. 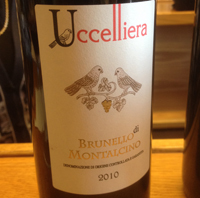 Tasted on January 23, 2015 the Uccelliera brunette di Montalcino showed a closed nose with reduction and earthy red fruits, it has a remarkably pure and expansive palate revealing little of it’s future greatness, though the basic blackberry, plum, minty herb, tobacco, kirsch and savory spice are attractive, and while pretty shut down you can see the light at the end of the tunnel. Polished firm tannins, good acidity and mineral tones make it clear this is one of the best structured Brunello vintages since 2004, and while the feel is somewhere in between a young Bordeaux and a young Burgundy, there is no question the quality is there and that this is a special wine, this is a serious Sangiovese Grosso. With air more beautiful elements come to play in the Uccelliera with incense, rose petal and cedar spice, licorice and meaty notes unfold, it will certainly be a joyful experience to revisit this well crafted wine in a few years, drink from 2018 to 2030. 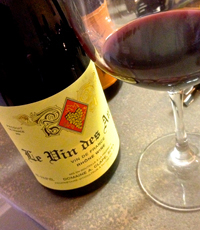 2013 Domaine Auguste Clape, Le Vin des Amis, Vin de France, Rhone Red, France. The Kermit Lynch imported star of Cornas, (the) Domaine A. Clape makes some of the world’s finest and most distinct Syrah, and these wines sell out very quickly, but savvy wine lovers looking for a value should explore Clape’s Cotes du Rhone and this Vin de France in particular, the Le Vin des Amis is a pure Syrah that way over delivers in quality and detail at the asking price. Even in a restaurant with high margins this wine makes an excellent choice, giving lots of terroir character, dynamic flavors and it has the added benefit of being a deep Syrah wine that doesn’t mind being opened young. The latest Le Vin des Amis, from 40 year old vines grown a ways away from Cornas on river stone soils, it is fermented just like the top cuvees with whole cluster and native yeasts in cement cuves, and while the Cornas wines go on the spend almost 2 years in big foudres, the Cotes du Rhone and this Le Vin des Amis are aged half year in old foudres (neutral wood cask) and 6 months in the cement vats before release. While the Le Vin des Amis misses some of the power and intensity of the granite soils, it makes for a pretty impressive Syrah non the less and this 2013 is wonderful and full bodied with a deep purple hue in the glass and beautifully transmitted detail and old world charm, this is very much a northern Rhone Syrah with a nose full of violets, scorched earth, lavender, iron/mineral notes, camphor and blueberry and concord grapey notes leading to a lush palate of blackberry, boysenberry, plum and fig paste along with black olive, celery seed, minty herbs, currant/creme de cassis, european salted licorice, crushed stone and peppercorns. The fruit lingers expressively on the finish and with air some some nice savory and meaty elements shine through, while the alcohol is at a low 12%, with modest tannins and fresh acids, making for a wonderful wine with all kinds of food choices, this wine is a winner, especially in this vintage, drink from 2015 to 2020.
n.v. Sebastien Branger, Eclipse, Brut Sparkling Melon, Muscadet, Loire Valley, France. Along with his father, Sebastien makes a few hundred cases of this glorious bubbly, all handcrafted method traditionnelle from his tiny 1.5 acres of vines in Muscadet, these older plantings from 1964 and some from 1985 offer brisk intensity and plenty of briny sea flavors that come through in this sparkling Melon. The Loire is the Prosecco, this is the hot spot for quality and value in Champagne style sparkling wines these days, and while Branger’s Eclipse is not cheap at $20, it is certainly a superb offering that rivals many $60 Champagnes, this is great stuff. 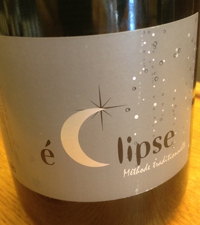 The Eclipse is a very dry Brut, 12% alcohol, was bottled April 11, 2013 then disgorged on July 7, 2014, after spending some good time on the lees, and the classic terroir of clay and gneiss shines through with excellent mineral and salty flavors, perfect with oysters. The Eclipse shows vibrant citrus, green apple and chalky gravelly notes with a core of lemon/lime and melon along with steely mineral, hazelnut, bread dough/yeast with a fine mousse and an energy filled flow throughout. This vivid and unique sparkling Muscadet should age beautiful as well, a good 10 to 15 years, but it does give loads of pleasure and elegant detail now, drink from 2015 to 2025.